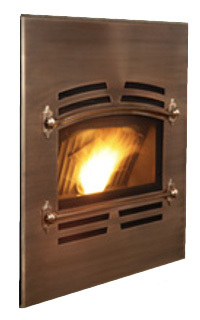 The Quadrafire Edge 60 pellet fireplace is designed for homes where no fireplace existed before. Similar to a fireplace insert, but larger, the Edge 60 can be fitted almost anywhere in the house that allows for venting. Either a false chimney breast can be built into the room, which does not have to extend to the ceiling, or what's called a 'chase' can be built onto the outside of the house to fit the fireplace flush with an internal wall. Think of both these solutions as a kind of cupboard specially built to house this pellet fireplace. Venting can then proceed as normal for a pellet stove. When building a chase, some thought should be given to access for vent cleaning and maintenance. To provide access for cleaning and maintenance, the Quadrafire Edge 60 is fitted with rails that allow the fireplace to slide out of its enclosure. It has the 'auto clean' firepot, (see below), and a decorative cast iron fireback. It will also run on twelve volt supply if a power outage occurs, using the optional battery cable. Available with four different decorative fronts, and optional colour schemes, the Edge 60 has a large viewing window and a 120 pound hopper - big enough to heat for up to seven days without refilling. Max. Heat Output 60,000 btu. Convection Blower Capacity 220 cfm. Window Size 18.5 in. by 12 in. Rear Vent Height 21.4 in. The floor of the firepot in the Quadrafire Edge 60 will open and deposit the ash into the ash pan. It takes approximately 2 minutes to complete the auto-clean cycle. The floor will then shut, and if the thermostat is still calling for heat, the fire will start again. When operating the Edge 60 under battery back up conditions, the stove has to be lit manually and will stay on minimum setting unless heat is called from the thermostat. There is no built in battery charger. An ash vacuum will be needed to carry out cleaning of the Edge 60 pellet fireplace. An outside air kit is required for this pellet fireplace. Not included. A non combustible floor protector measuring 38 in. by 6 in. will be needed in front of the unit. Clean the heat exchanger and drop tube. Inspect the firepot auto clean system, check the door latch and gasket, clean the hopper. If you would like to leave a review of the Quadrafire Edge 60, please use the form on the Contact Page.